“Fun” is a nebulous, subjective concept that many critics try to avoid, but there’s not a better word that sums up why Sekiro’s repetition never becomes a problem. Sekiro’s tightrope combat—a delicate balance of patience, timing and precision that can swing from stately to furious in an instant—is so physically and intellectually satisfying, and such a consistently evolving challenge, that it never grows old. It retains the same kernel of sheer, unabashed fun that you feel from the first time you get a handle of its defense-oriented, posture-disrupting action, but slowly tweaks it through the steady introduction of new skills and techniques. This might sound like a basic, fundamental description of how videogames are expected to operate: you learn to do a thing, and in the process of doing it a lot that thing gradually changes into a more elaborate and complicated thing. And although that’s true of Sekiro, the changes aren’t what keep that combat from growing old. The underlying engine of that combat—the strict regimen of blocking, parrying and attacking to wear down an opponent’s posture, and then closing in with an instantly fatal blow—is brilliantly realized from the start, turning every encounter into a miniature showdown that depends on a clear eye and a firm resolve. It’s brutal but lean, an economical approach to swordfighting that almost feels like a ninja sword equivalent of the terse and cutting diction of Richard Stark’s hard-boiled Parker novels, and even without the gradual additions and modulations those encounters would remain stressfully invigorating throughout. That combat also stays fresh because of the speed at which you can move around Sekiro’s world. Save points are often closer together than in From Software’s other games, reducing the amount of steps you have to retrace after every death, and thus the number of enemies you’ll refight over and over. 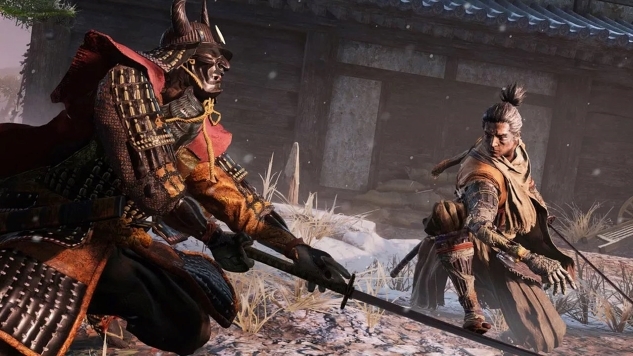 More notably, though, Sekiro simply lets you move faster through its world, with a sprint button that isn’t limited by a stamina bar, and a grappling hook that lets you quickly zip from point to point. When you’re getting tired of replaying a segment over and over, you can often use this increased freedom of motion to blast past or swing over enemies that you don’t feel like fighting again. It essentially lets you dictate exactly how repetitive the game will be, even while restarting from the same save point over and over. All videogames have an amount of repetition baked into them, but few are as intentionally and rigorously repetitive as Sekiro. It’s a testament to From Software’s design acumen that they’ve been able to turn that repetition into a positive through such a well-crafted style of combat, one that remains consistently entertaining and stressful throughout the whole game—no matter how many times you have to parry the killer spurs of an enraged chicken before slashing into its ample, black-feathered breast.